Mountain And Glacial Landforms: What Is An Esker? Occurring in glaciated and formerly glaciated regions, an esker is a long, winding ridge of stratified sand and gravel. Esker at Fulufjället, western Sweden. 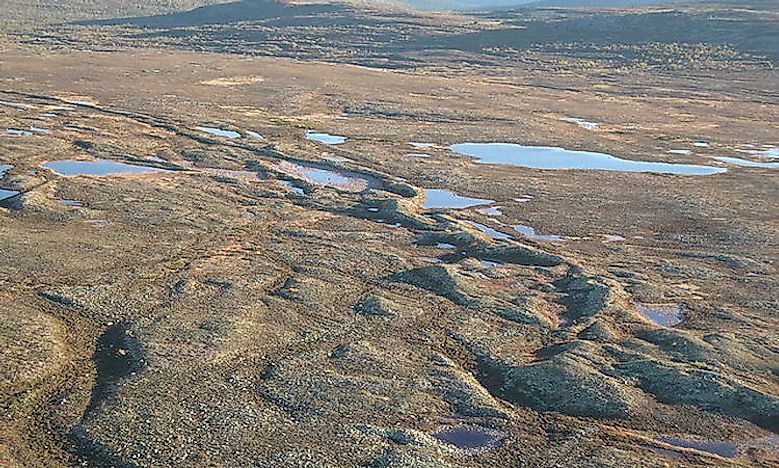 An esker is an attractive landform formed through fluvioglacial deposition. It is a winding ridge of low-lying stratified sand or gravel dominating the terrain and providing the vintage point and dry routes. An esker occurs in a glaciated area or a formerly glaciated region, especially in Europe and North America. The esker lies on valley floor within the ice margins marked by a moraine system suggesting that the eskers are formed beneath the glacier. The word esker is an Irish word meaning a ridge or an elevation which separates two plains. The term is also used to refer to ridges which are deposits of fluvioglacial material. Eskers vary in size and shapes with most of them being sinuous. The longest eskers are continuous and measure few kilometers while most of them are short and discontinuous. Eskers are formed on washed sands and gravel. Most eskers are formed within ice-walled tunnel by streams which flow under and within glaciers. When the ice wall melts away, water deposits remain as winding ridges. Eskers can also be formed above the glacier through the accumulation of sediments in supraglacial channels. Eskers are formed at the terminal zones of glaciers where the ice is flowing relatively slowly. The melt water collects and flows through a network of tunnels. This water carries highly charged with debris which is composed of coarse-grained gravel which are stratified and sorted. The shape and size of the subglacial tunnel are determined by the flow and melting of the ice. The form of the tunnel then determines the shape and structure of an esker. Esker may be part of a branching system of tributary eskers or may exist as a single channel. The gaps between the esker ridges separate the winding parts of the eskers while the crests on the eskers are knobby. The path of eskers is regulated by the pressure of water flowing through it. Most eskers are discontinuous because the sedimentation process may fail to take place on the entire length of the sub-glacial tunnel. Eskers are common in glaciated areas or formerly glaciated regions. Sweden is home to one of the longest eskers, Uppsalaasen, which stretches for about 250 kilometers and passes through the city of Uppsala. The Highest peak in North America, Great Esker Park, is found on the Back River in Massachusetts. Pispala and Punkaharju in Finland are located between Finnish Lakeland curved by a glacier. The esker in the village of Kemnay, Scotland is locally called Kemb Hill and is 5 kilometers long. The state of Michigan has over 1000 eskers, especially in Lower Peninsula with the longest esker, Mason Esker, measuring 22 miles stretching from DeWitt and ends at Mason. The Thelon esker crosses the border between Northwest Territories and Nunavut in Canada and runs for about 800 kilometers. Mount Pelly is also an important esker in Canada located in Ovayok Territorial Park. Eskers play an important role in the ecology of Canada. Plants growing on eskers are a primary source of food for bears and migrating waterfowls, especially during winter. Roads can also be built along eskers to lower the cost of such constructions. Examples of roads build on eskers include Denali Highway and segments of Maine State Route 9. Mountain And Glacial Landforms: What Is A Cirque? Mountain And Glacial Landforms: What Is An Arête? Glacial Landforms: What Is A Moraine?